I had a nice and relaxing weekend, even with the grading and lesson plans that I had to write. I felt good about the tests I graded because, even though the average was not as high as I would like, there was a clear delineation between the students who were participating and taking notes and those who were not. I'm hoping that we will be able to have a serious conversation about the benefits where I can point to specific people who drastically improved as a result. I offered for my Math 8 classes to be able to do a test recycle. They can make corrections to their quizzes if they choose to do so. The recycle has a specific format and I told them it was important to follow that format, but I'm thinking I'm going to ignore it as long as they have all of the aspects I want, including answer, work and reasons for mistakes. If I can get my laptop to run Skype, we will doing a Mystery Number Skype with a 7th grade class in Georgia tomorrow. At its most basic, the classes give each other word problems to solve. I am hoping that this will be a good experience for my 8th period but I'm very nervous about how they will represent themselves, the school and me. I Skyped with another class last year and the behavior of my students was so appalling that I called to apologize to the teacher afterwards and we never did it again. I am hoping that with a little more prep and much clearer expectations, I can avoid that this time. We spent the second half of class developing a few problems that we could ask them. It went fairly well and we came up with some pretty good problems. While all of this was going on, a few students were in the hallway making up the tests that they missed on Friday. Another faculty member relayed to me later that one of these students was asking her questions to Siri. She was reading them off of the test and directly into her phone. 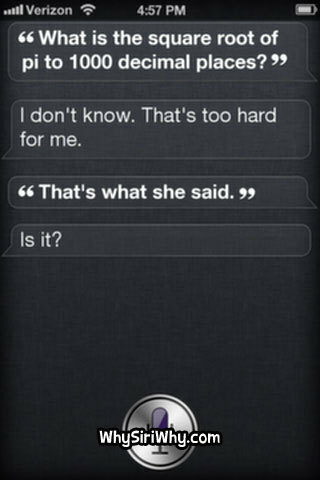 Siri: "How can I help you?" Student: "Juantay spent $8.58 for 3 notebooks last year. This year, he needs 5. How much is he going to spend?" Siri: "I don't understand the question." Student: "How much will he spend this year?" Siri: "I'm not sure I know what you mean?" Student: "I need to know how much the notebooks cost." I'm having deep philosophical differences with a few of the students in geometry about the nature of education and the purpose of a teacher. I could have handled the conversation better, but the feeling of insult that I perceived was very strong. I was asked to go over the guided notes for the section, which I willingly did. Instead of me boring them with the droning monotone of my voice, I handed off the pen to a student and took a seat in the back of the room. For the rest of the period, she fielded questions and answers from the class as I watched and made sure wrong answers didn't stay up on the board too long. When we finished and I gave a challenge problem, one of the students who disagrees with my methods asked if she could go to see another teacher "since we are done." We were not done and, this far into the year, for her to think that since I wasn't lecturing that it meant we weren't learning was very insulting. I know that I shouldn't take it personally, but it's hard to avoid. I can see this interaction getting worse before it gets better and I'm not sure how to handle it. I've been reading your blog for a while but this is the first time I've commented. I am impressed by your fortitude. I am intrigued by your skyping. I think my kids would get a kick out of this. I also teach Math 8. I have a much neglected blog at ificoyldonlyfindyhewords@blogspot.com bit you could also email me at nikkipooni@yahoo.com if you are open for another skyping partner.